I’m sorry! This workshop is no longer running. 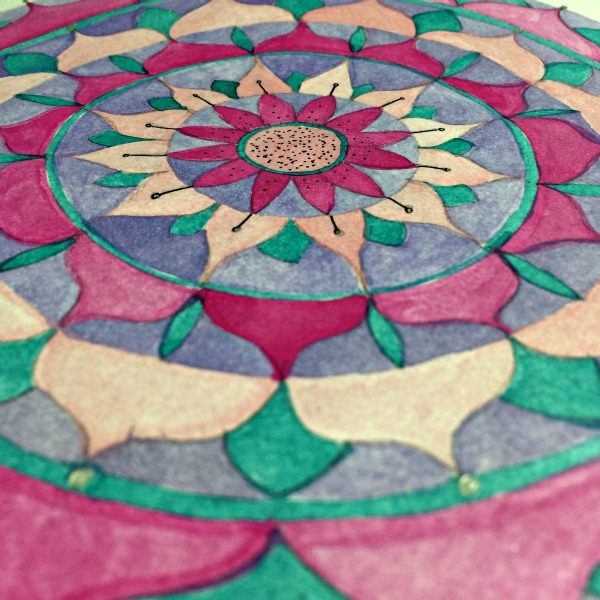 Please sign up for news + updates on future mandala workshops. Discover how to create beautiful images + extract more meaning + create magic. Five Days of Mandala Magic is a free online workshop that demonstrates how, with a little know-how + some tools + techniques, you can create beautiful mandalas anytime you feel called – even if you’re not an accomplished artist! During our time together in Five Days of Mandala Magic, I demonstrate different ways you can engage with the mandala, including simple methods for construction which you can repeat over and again to create unique designs you love. Mandalas are part of a symbolic language that helps us express the mysterious forces we find running through the currents of our lives. Over the five days, you’ll learn how to decode these symbols to make more sense of your existence. The mandala is my touchstone. It provides the anchor for my rotation on the great wheel of life. It is my organising principle and my go to symbol. For you, the mandala may be something else entirely. During our time together in the Five Days of Mandala Magic, I’ll demonstrate different ways you can personally engage with the mandala. What’s in the Five Days? What to expect from each of the tutorials during our event. Learn about the origins of the mandala and what it has to offer our contemporary lives. Discover the powerful symbol of the circle and experience the circle in practice. 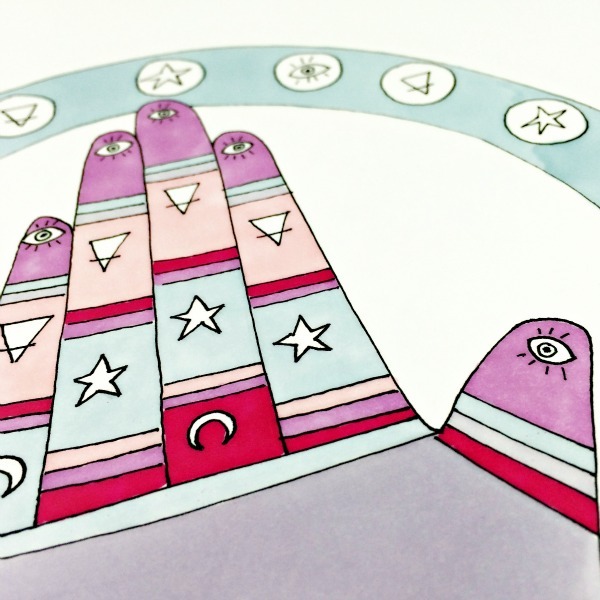 The hamsa protection symbol is increasingly seen outwith its origins of culture. The fourth tutorial in our workshop demonstrates how to construct a contemporary version of this powerful symbol. The lotus flower is an iconic symbol. 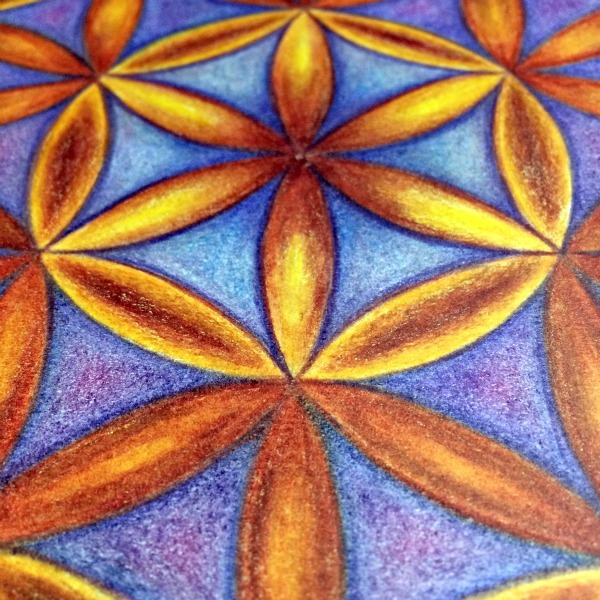 Find out why and practice using a twelve-point mandala grid to create a beautiful + very flexible mandala flower design. 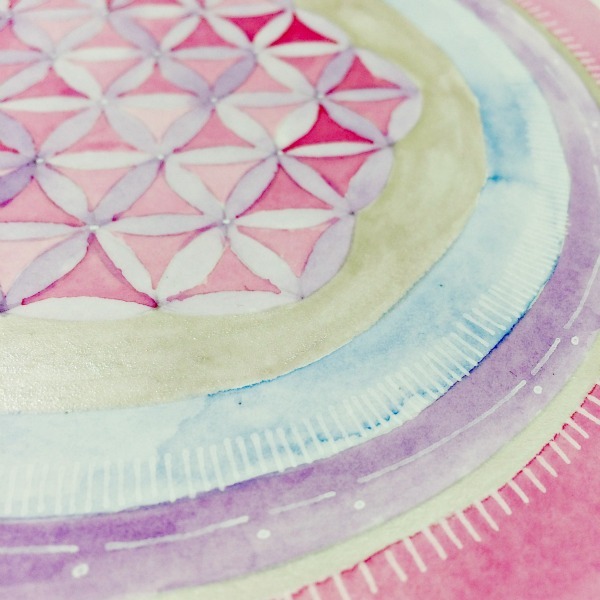 On our last tutorial of the five days, we’ll explore some further aspects of the sacred geometry hinted at on Day One and use this cosmic patterning to create another iconic mandala design : the Flower of Life. 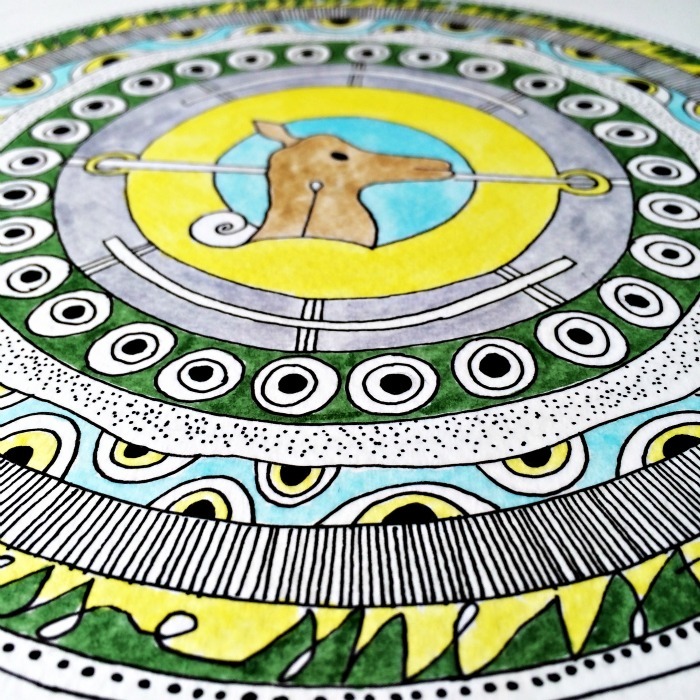 In this tutorial you’ll learn more about the ancient symbolism of concentric circles and how to construct unique mandalas based on this tried and trusted foundation. Each lesson contains a video introduction + video demonstrations. 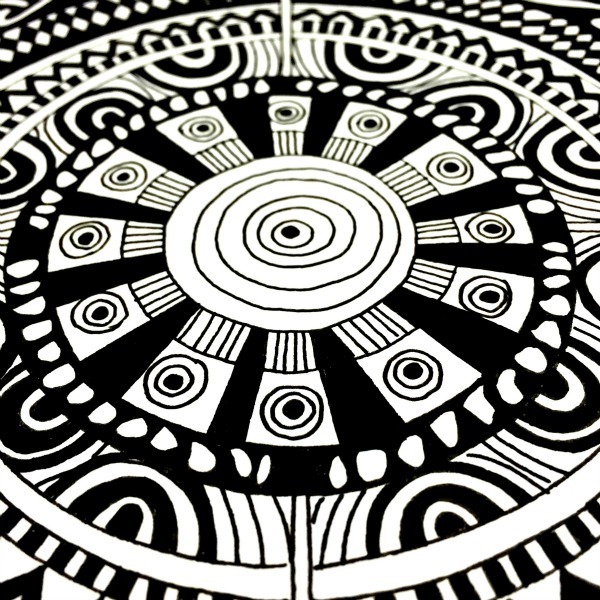 I also share some personal mandalas + insights into how I combine mandalas with self-exploration, dedicated to awakening. This is the third year of this super popular event – back by popular demand! Five Days of Mandala Magic is designed for anyone who has felt the pull of desire any time they’ve seen mandala art, and wants to learn how to make their own but doesn’t know where to start. You’ll enjoy it even more if you’re keen on searching out the deeper meanings behind the work you create. Do I need to be able to draw to complete this class? You don’t need to be “good at art” to enjoy Five Days. This isn’t a class for accomplished artists, although you’ll get the most out of it if you already enjoy creative exercises and have a desire to create drawings and images that carry meaning for you. If you are an artist who wishes to explore the basics of mandala construction and learn more about different theories and the symbolism behind the form, then you’ll be off to a head start and will romp through the content! You will definitely need a journal, sketchbook or other paper upon which to create your mandalas. You can make it as fancy or ordinary as you like – this is your mandala experience. I prefer to use sketchbooks designed for art, rather than journals designed for writing. These come in a variety of types and sizes – my favourite is a UK size A4 or a US size 12×9” and I like the books made by Stillman & Birn (Zeta series) and Strathmore. You can use a smaller book or paper, but you’ll find it quite limiting and soon feel the need to expand! Additionally, you’ll need something to colour in your work. That can be as simple as some basic children’s art supplies – like coloured pencils or felt pens. Although it’s tempting to go out and collect a whole boatload of new shiny supplies, it’s always best to interpret the lessons to make use of the supplies you already have, before you discover what supplies you actually want to work with. During the five days, I’ll demonstrate using watercolours, watersoluble crayons, oil pastels and marker pens, including alcohol markers. Depending on your experience, you’ll need to allocate up to two hours to watch each of the lessons and complete your own mandala. This workshop is delivered to you online, so as long as you have a valid email address and are able to access a computer with internet access, you are able to participate from anywhere in the world. The content will be delivered on my website with a mix of writing and some video, so you will additionally need to be able to stream video and audio. I use Vimeo to host videos, so please make sure you are able to view their videos. The content is hosted on the website for you to access at your own pace for the duration of the workshop. There’s no need to show up at a specific time, so you won’t miss out if you’re in a different time zone, or need to login after your day’s work. I’m busy and won’t be able to complete all five lessons by 14th November - can I still join in? Absolutely! Access to the content will be delivered to you between 7th and 14th November, but there’s no requirement for you to complete all the exercises during that time. You will have access to the lesson content until 1st December 2016. I took part in the Five Days last year - is there anything new for me this time around? The 2016 edition of the Five Days contains exactly the same exercises as 2015. Don’t let this stop you from participating! If there’s one thing I’ve learned through my mandala practice, it’s that repeating mandala exercises always unveils new revelations, provides deeper understanding, allowing for a greater expansion in consciousness. Will it cost me anything to participate in the Five Days of Mandala Magic? This is a free workshop. The entire five days will be delivered to you free of charge. No obligation. Enter your name + email address – I’ll automagically send you a confirmation email. Click on the link in the email to confirm your subscription. On Monday 7th November, I’ll send you an email with a link to your first lesson. You’ll receive an email with a link to content each day it becomes available. What will you do with my email address when I register? I respect your right to privacy! Once registered, your email address will be securely stored in my classroom mailing list, serviced by Mailchimp. This is the email I’ll use to send you workshop information. Your data is never shared or sold with any other business. You will also automagically join my very infrequent mailing list. You are free to unsubscribe from the mailing list once you’ve completed the program.